For Strong, muscular and attractive body figure it is most important to burn your extra body fat. One of the most effective way to burn your body Fat is to burn more calories than your daily intake. While achieving the goal of an ideal body figure your body's Fat loss is more important than weight loss. The craze for losing weight often mislead people to wrong kind of diet plans that may lead to weakness of body muscles and reduced your facial glow. Due to too much busy life routine, often people are unable to get some extra time to perform heavy gym workout to burn fat and calories. However there are number of foods which help a lot to burn calories and reduce your excessive Fat. 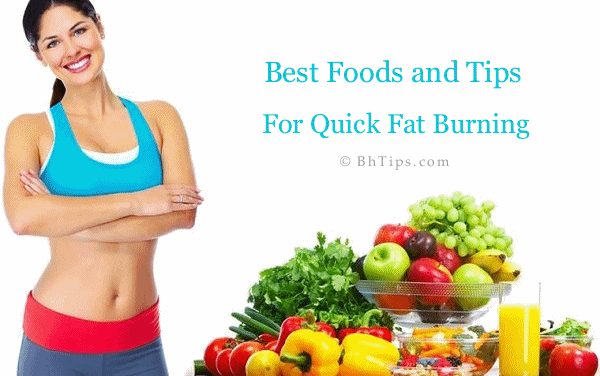 Some useful Tips and Foods are given below which naturally burn your fat and help you to get an ideal body figure. When we talk about best foods and tips about fat burning then Citrus Fruits comes at the first. Citrus Fruits containing vitamin C are considered best for burning Fat. Try to intake lot of citrus fruits into your diet such as oranges, grapefruit, blueberries, tangerines, lemons and limes.Vitamin C is necessary for the creation of carnitine, a natural substance that metabolizes fat to energy. Oranges are rich in Vitamin C and they have fat burning properties. Compared with exercises they are an effective way to lose fat. Consumption of grapefruit or grapefruit juice helps a lot in losing body fat and weight. While incorporating the grapefruit for weight loss, try to enjoy the whole fruit or purchase a juice with no additives, sugars, or concentrates. Get the maximum fat burning benefits from Fresh squeezed grapefruit juice. Besides fat burning, this fruit prevents you from overeating by keeping you satisfied and your blood sugar regulated. Apples also contain vitamin C and malic acid. Malic acid helps your body convert fat to energy and since apples are water based, they will keep you full longer. Calcium in dairy products like fat free milk and yogurt act as fat burner that can boost weight loss by increasing fat breakdown in fat cells. Fish oil is known to lower cholesterol and burn fat. Fish oil contains the omega-3 fatty acids which increase metabolism by lowering insulin levels.Try to eat fish twice a week.You can also take fish oil supplement in either pill or liquid form. Chicken breast meat is the leanest part of the chicken and a great source of protein. Protein-rich foods stimulate your metabolism and help to burn fat because it requires more energy to digest, which results in more fat burned. Almonds contain magnesium that helps to regulate energy in your body, resulting in more fat burned. They are also full of protein, vitamins and fiber. Protein builds muscles and muscle cells and help to burn fat. Melons and watermelons are full of antioxidants and vitamins needed for the efficient operation of your metabolism. They are also high in potassium, which is needed for cellular water balance. If your cells do not have enough fluid, this can cause your metabolism to slow down. Coffee contains caffeine, which helps mobilize fats from the fat tissues, increases metabolism and contributes to the number of calories burned. Coffee increases the level of Epinephrine hormone that travel through the blood, to the fat tissues and send signals to break down fats and release them into the blood and making it available for use as free fatty acids in the blood. Green Tea rich in polyphenols and catechins, is very helpful for inducing thermogenesis and stimulates fat oxidation. Green Tea is very useful to increase resting metabolism and stimulate fat-burning. Beans are high in protein which helps your body build muscle. Muscle cells burn calories at a much higher rate than fat cells so even a slight increase can really help you blast away the fat.Fibers in beans also prevent your body from absorbing fat. Oatmeal is an awesome fat burner.Having oatmeal for breakfast can also increase your metabolism by as much as 10% so you will burn fat at a higher rate than normal. Salmon is among the best fat burning foods because it is high in Omega 3 which helps lower your leptin levels which in turn helps your body burn calories faster. just like salmon, sardines are also very helpful to burn fat cells. Sardines are packed with fish oil which is also known as a great fat burner. Garlic is one of the most effective fat burning foods. It acts as a thermogenic in the body which speed up heat producing process of the body and helps a lot to increase body's metabolism. Garlic has been linked to lower blood sugar levels and acts as a fat burning enhancer. It also helps reduce cholesterol and unhealthy fats. Tomatoes are also considered a good fat burning food. According to recent scientific research, Tomatoes have the ability to effectively activate your DNA to burn of more fat. So put fresh tomatoes in the sauces that you make so that you will get a boost to your metabolism. Mustard seeds also helps a lot to burn fat and increase your metabolic rate. As little as 1 teaspoon of spicy mustard seeds can boost your metabolism like caffeine, but without affecting your sleep. Curry leaves flush out fat and toxins, reducing fat deposits in the body. To enhance fat loss you can also include curry leaves in your diet plan. Foods containing chillies or cayanne pepper are considered to be as foods that burn fat. Chillies contain capsaicin that helps in increasing the metabolism and burning fat.